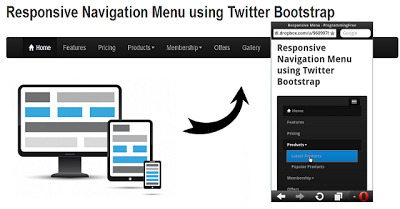 IT is very easy to create a responsive navigation menu that will automatically turn into dropdown list for small screens by bootstrap. 2. Create an html file and place the ‘bootstrap’ folder from the download in the same location as this html file. will need ‘bootstrap.css’,’bootstrap.responsive.css’ and ‘bootstrap.js’ from the download. 3. Put below code in the html file you created.